This week's #FridayReflection is: "Share your favourite TED video / talk and tell us why you love it so much". What I'm sharing isn't actually a Ted talk, but it is from Brene Brown who has some amazing insights into why we do the same small destructive things over and over again. In another short video I watched recently Brene talked about boundaries and empathy and giving people the benefit of the doubt. A lot of what she has to say is about taking responsibility for yourself and your feelings. Not trying to blame or sugar coat - just letting things be as they are and dealing with them in an adult and intelligent manner. I've got a long way to go with this (hence the video being shared by my beloved!) 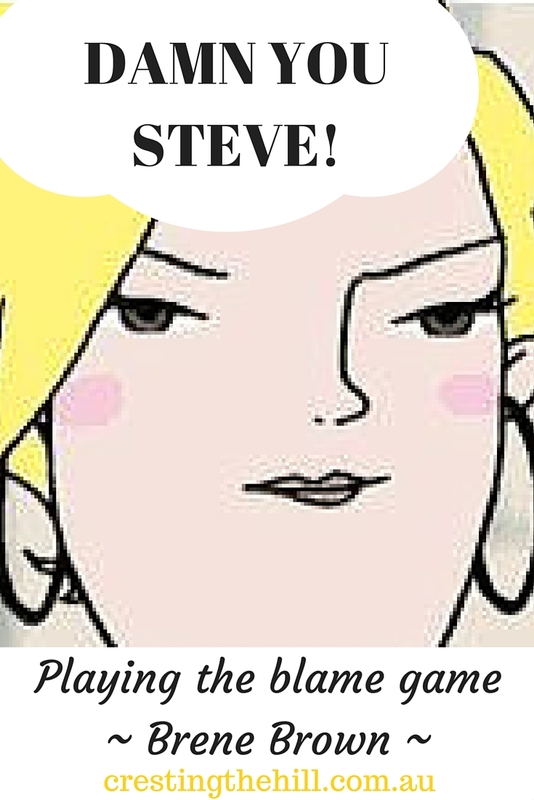 but it has given us a catch-cry to use whenever the blame game starts - DAMN YOU STEVE! Here's the video if you want to have a quiet smile to yourself and you might even find it helpful too! It's really hard when the kids leave home and the dog dies and it's just you and the hubby and you run out of people to blame. That is too funny! We just went to a series of workshops on forgiveness. They really helped. Funny! I hadn't heard of Brene' Brown, but I'll have to look for more of her. She is amazing Lori - there is another one on empathy (something else I need to work on!) and a 5 min chat on boundaries that I put up on my fb page because it was so on the knocker correct. She's very down to earth isn't she Liz - I love that it's not all fluff and bubbles, but good solid advice. Love this and love her. I'm guilty of the blame game way more than I want to admit! Loved this video. I'm more of a root-cause-analysis sort of person, asking Why? at least five times. If I can figure out why it can happen, I can prevent it from happening again. Much more controlling than blaming! Brene is amazing! I've been a fan before she was well known. She spoke at a breast cancer retreat I attended in Austin. Funny, poignant, the read deal. What an awesome clip! This is the first time I listened to Brene and what s sensible piece this is. Many thanks for sharing! I just love her - so practical and down to earth and yet so relevant! I love games but as we are learning here the Blame game is so destructive. What an awesome little video, so simple and easy to watch with a powerful message. How intuitive of your husband to send that to you, so thank him from us too 'cause we are all enjoying the nudge to better relationships. It was a great little summing up of what we do without even thinking about it (and how toxic it is to relationships) I think my husband was on to something! Wow! I love TED Talks. They are small dosis of truth that opens our eyes. It took me ages to realize I was a blamer and even though I still go back to the bad habit sometimes, I'm now aware of it. It doesn't control me anymore. Loved your choice, Leanne! It was a new video for me. Thanks for sharing it. Hi Debbie - I think being a blamer is something a lot of us revert to when our world gets out of order and we want a reason for it. I'm working on it! This is a great one. Thanks for sharing on #FridayFrivolity. I hope you join us again next week. 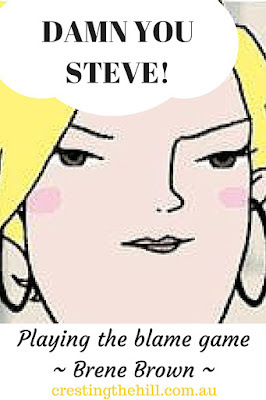 Ummmm my husband's name IS Steve. Damn you! Just gotta love Brene Brown! Watched her interview yesterday on Creative Live. She is awesome and I enjoyed your post!